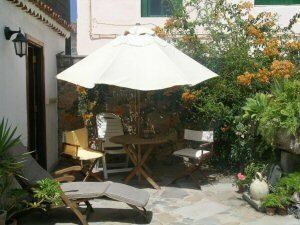 The Casa Patio del Naranjo is situated just a few metres away from the Church of San Antonio of Padua in the richly historical area of Granadilla de Abona. It is just a few minutes from "Reina Sofia" airport and El Medano beach (10 minutes), 25km from Teide National Park and 20 minutes from the main tourist centre in the south of Tenerife. The cottage has been carefully restored and retains the character of the traditional style of architecture and building. Enjoy the tranquility of the surrounding area, during your stay in Casa Patio del Naranjo, or visit the fountains "Del Lugar" or "Cruz de Tea" or take a refreshing swim in the natural sea water pool at El Medano, where you can also experience other water sports including wind surfing. The accommodation consists of one double bedroom and there is also a sofabed in the lounge. A cot can be provided if requested. The kitchen has an oven and fridge. Heating is provided. 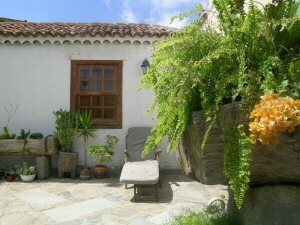 The cottage is 12km from Reina Sofia Airport and 85km from Los Rodeos Tenerife North Airport. The nearest restaurants are 10m away and the supermarkets are 500m away and the nearest beach is 9km. Extra nights can be booked at a pro rata rate. This price is for the property based on 2 people sharing.